If you have a question that is not answered on this page, feel free to contact us. Q: I'm new to the sport of shooting. How do I start? A: We are glad you are interested in shooting with us. After filling out our electronic safety waiver (completed here at TMGN) and watching our safety briefing, let us know it is your first time. We will guide you through the different rental options we have and make sure you have everything you need to shoot safely, and feel comfortable, at our indoor shooting range in Frederick. Q: How old do I have to be to rent any guns? Q: This is my first time at The Machine Gun Nest. Do I need to bring anything? A: Make sure you bring valid photo identification to our shooting range. Q: Can I bring my own guns and ammo? A: If you're bringing your own personal firearms to shoot, you can definitely bring your own ammo! We only require you purchase ammo from us when you are renting any of our firearms. Our ammo must be ran through our rentals, no exceptions. Q: Is there any ammo I can’t shoot? A: Steel core, armor piercing, tracers, and any non-slug shotgun rounds are not permitted at our indoor shooting range. Q: What calibers can I shoot? 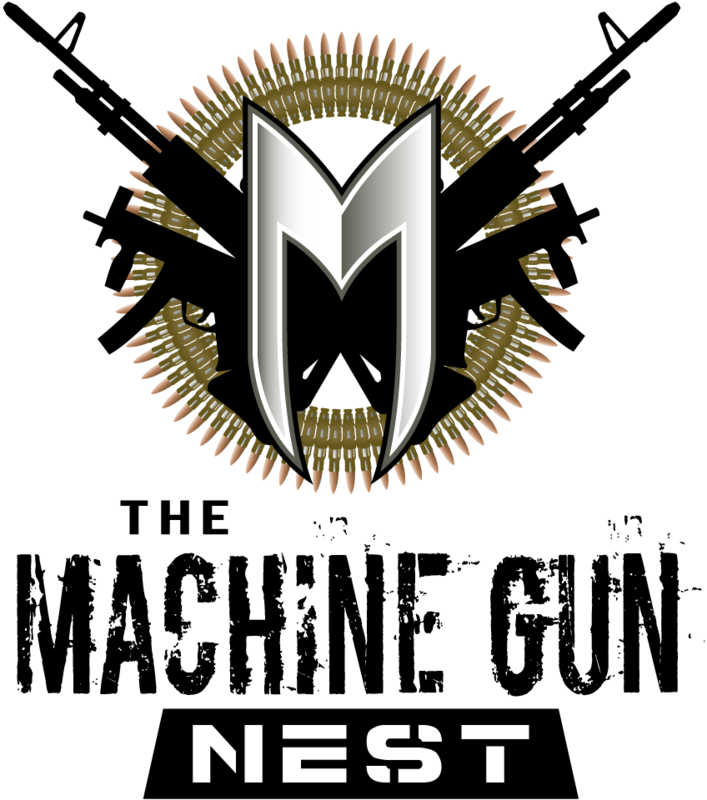 A: You can shoot up to .50 BMG at the Nest. Shotguns are slugs only. Q: How many lanes do you have? A: We have 12 lanes at our indoor shooting range, all of which are used for any caliber up to and including .50 BMG. We run pistols, rifles, shotguns, and full-autos on all 12 lanes. Q: Do you have guns available to rent? A: Absolutely! This is one of our main attractions. Not only do we have a wide variety of pistols and rifles available to rent, but we also have a huge selection of machine guns that you can rent! Q: What if I’ve never shot a gun before and want to come to your range? A: Then welcome! We’d love to help introduce you to shooting. We have expert instructors that teach intro classes on a weekly basis. Our staff is available to answer questions and help you on the range as well. Talk to us about our firearms training courses. A: Of course! TMGN is kid friendly and we encourage parents to bring their children out with them to ensure they are learning proper and safe handling. Children must be at least 10 years old and accompanied by a parent or guardian at all times. Q: Can you really rent Machine Guns?!?! A: Yes you can rent machine guns, however it’s while under the supervision of a range safety officer at all times. You must be at least 21 years old to rent a machine gun. Q: Can you take rented gun off site? A: No. Under no circumstances can you take a rented firearm outside of the range. Q: Can we purchase machine guns? A: Short Answer: There are some machine guns that can be purchased that were built before May 19, 1986. These are know as Transferable Machine Guns and they are very limited and very expensive (for obvious reasons). Anything built after that date is only allowed to be owned by manufacture FFL holders, law enforcement, and government agencies. We do not sell machine guns. Q: Are there Military or Law Enforcement discounts? A: For memberships only, we have a 10% discount for retired military (just show us an ID) and law enforcement (show us your badge). Active military and LEO memberships are: $200 for an individual, $300 for a family. Q: Do you offer any safety classes? A: Yes. This is one of the features we are always really excited about. We provide classes for people with all different skill levels to be able to learn and improve. Come check out our firearms training courses under the instruction tab! You can always call in and set up one-on-one training, as well. Q: Will there be instructors available? A: Yes. Throughout the week, you will see many of our instructors around the range outside of the posted class time. If you see any of them, feel free to ask any questions. They are happy to help. Remember, you can always call in and set up one-on-one training, as well. Q: What is the distance of each lane? A: Each of the 12 firing lanes are 25 yards each. Q: How many people can be on a lane at one time? A: You can have two shooters on a lane; the first shooter is $20/hour and the second shooter is discounted to $10/hour. Any additional shooters after that are back up to $20/hour, on an additional lane. Q: Will you have a gunsmith? A: Yes, we have several gunsmiths that are working with us. Turn around time varies, but you can always stop in and talk to a crew member for inquiries. Q: Do you have to be a member to shoot, or is the shooting range open to the public? A: The indoor shooting range is open to everyone, regardless of whether or not you have a membership with us. TMGN Members do receive a handful of membership perks, though! Q: Is there a Range Safety Officer on staff at all times? A: You bet! Safety is paramount here at the Nest. There is always an NRA certified RSO (Range Safety Officer) on the range. All of our crew members are certified through the NRA. Q: Can members shoot as long as they want since they don’t pay for range time? A: Usually, yes! If there is no wait, Members are certainly able to stay out there and continue shooting after the hour. However, if all 12 lanes are full and people are waiting, we cycle everyone in and out of the range one hour at a time. Q: Can I rent safety glasses and hearing protection at TMGN? A: You bet! If you do not have your own safety protection, we have options available for rent. Q: What happens if I want to bring a guest who is not a member? A: Non-members can shoot for $20/hr without any commitment. If you have a membership with us and want to bring a guest along, your guest will pay $10. Q: Do you allow suppressors at the range? A: Yes. We do allow suppressors and we also a handful of them available to rent at the shooting range, on our firearms. Q: Do you allow drawing from holsters for those wanting to practice for IDPA or CCW? A: Holster fire is permitted only for members who have taken the holster fire class. The holster fire class is not available to non-members. Q: Does the family membership apply for an unmarried couple living within the same household? Or would this require two individual memberships? A: If a couple lives in the same household (as shown on drivers license) a Family Membership would work for you. Feel free to come speak to us at our indoor shooting range in Frederick about membership options.